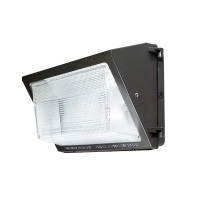 Howard Lighting's LED Medium Wallpack is ideal for parking facilities, entry ways, perimeter/pathway lighting or underpasses. Photocell adaptable and UL listed for wet locations. One-piece die-cast aluminum housing and hinged, removable die-cast aluminum door.